Research has identified the ship as the James Whalen. The tug was built in 1905 for the Canadian Towing & Wrecking Company of Port Arthur, Ontario who used her as an icebreaker. The ship had a long and distinguished career and made her mark in Great Lakes maritime history when on April 4, 1910 she became the first Canadian vessel to send a wireless message. The tug retired in 1992. Instead of being scrapped, the ship was returned to her original home of Port Arthur, now known as Thunder Bay. The ship was restored to her original 1905 configuration and is now a tourist attraction in Heritage Park, which located along the Kaministiquia River. If you wish to see a photo of the James Whalen as she appears today, please click here. I grew up on this tug. My dad Was Charlie McInnis and he worked for J.P.PORTOR Company Ltd. as a General Supertendant and Vice President. 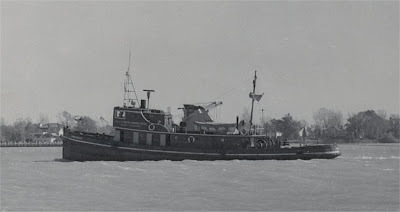 J.P.Portor Dredging Company Limited owned this "GREAT TUG BOAT " For a number of years till 1978I believe. They changed her over to a Train GM 1600 MD Diesel for power. They also rebuilt the Wheel House making it a nice look and larger. She had all Brass works in the Wheel House. Big brass wheel for steering, large brass and Teak compass forward of the wheel Large two handled telegraph tell the engion room what to do . As A young boy I was on this tug every min. I could be. When I got old enough to work I would chip and paint the house works, Chinese red, the hull was Shutter green ,the stack Buff , the big " P " on the stack Black then the trim White and Black. When she was all painted up she was a proud looking tug. She had three large winches on her stern deck and an Ice breaking " Bow " . She was one of the best "towing tugs at that time" , and my dad was proud of her the most of all the companies big tugs. What I loved about this tug was the sound from the big diesel and how it sailed through the water by its self or towing a the dredge "Shunia" along with a Crane Barge " Page", with two large work boat tugs at the same time. Breaking the Ice in the Welland Cannel or the St. Lawrence seaway or many different harbours. I always felt safe sailing on board " This Great Tug" The "James Whalen". My dad was great person who always took care of his many crew members over the years. His passion for the many people and the equipment they worked on. Weather you were working the decks or the Caption you were treated the same. The people who worked on this tug kept her looking and running great. I That is why I was so lucky to know the great people who sailed and worked for J.P.Porter while the "James Whalen" was owned by them. She is back in Thunder Bay know and looking like she was at first but I still love her the way she was in this picture. My dad has passed away and so have many of the people who crewed this " Great Old TUG " but I am glad she was saved from the scrap yard and is still afloat today. November 28 /2012 . My dad was a fireman (shovelled coal) when it still had a steam engine at the time I believe it was owned by Oscar Stiff.I think it was in the 40's his name was John Westerback. My grandpas tug Poibt Valour was the one that towed the James Whalen (Dennis V) to Thunder Bay in 1992. I work on the point valour as a deckhand and my dad was also a deckhand on the valour. My great grandfather worked on the James Whalen for a little while as a cook so when my grandfather was aproched to have his tug tow it home he was happy to do it for the family heritage in Thunder Bay. To any of that had family member sail her: I am trying to solve a mystery of my own here. My great great grandfather Horace H. Thompson of Duluth, MN was a commercial diver. Ive found newspaper clippings that detail he and his brother boarded the James Whalen in late 1928 and found the wreck of the Kamloops. Now this is very controversial to every current article, they all state it was discovered by scuba divers in 1977. There are two articles and my grandmothers word to back up my findings. My question is, have any of you heard your family talk of divers or the Kamloops? if so, please email me at pjnorick@hotmail.com Thank you!